Our Support Center is organized in a way to make it as easy as possible for you to find the content you need in order to most effectively use PrecisionLender, and if you need help, to contact our support team. Feel free to call us at 1-877-506-2744, send us an email at support@precisionlender.com, or submit a support ticket for our agents to review. See this article for more information on contacting us. How do I log in to the Support Center? You'll use different login credentials for the Support Center than you do for PrecisionLender. You'll need to log in to the Support Center to view any attachments sent to you in support tickets, and you can also log in to view your open tickets and subscribe to Release Notes. To start, click the "Sign In" button in the upper right of the page. This will bring up a prompt to log in. From here, you can log in by entering your username and password. If you've forgotten your password, you can click "Forgot my password" and enter your email address. 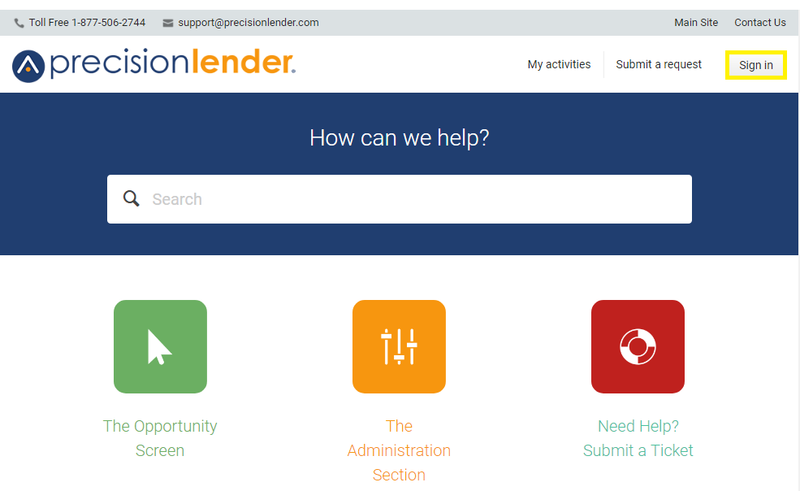 If you've never signed in to the Support Center before, but you've reached out to PrecisionLender Support, you should be registered already and will just need a password to log in. Click "Get a password" to get an email sent to you with instructions. If you've never signed in to the Support Center, and you've never reached out to Support, click "Sign up" to register an account. If you can't remember if you've reached out to Support before, or if you have any trouble, please reach out to us! You can email us at support@precisionlender.com or call us at 1-877-506-2744. The Relationships Section discusses the Relationship Awareness module, which allows you to understand the strategic value of your existing relationships with your clients. Forgot your password? Visit Reset Password for instructions on accessing your account. In the event of any interruptions in service, a note will be posted on our System Status site. For information on compliance and due diligence, visit Compliance. The Release Notes are where we list software changes as we continue to improve PrecisionLender, highlighting changes that are the most visible to users. You can subscribe to the Release Notes to receive notifications by email whenever a new one is added by clicking the "Follow" button at the top of the page.